It's a necessity of field guides that they only cover the biological aspects of birds. Birders want to know which birds are which, and what it means when that one has an eyestripe and that one doesn't, and what it means when that one has a call like this and that one has a call like that. Reduced to these flat comparisons, though, birders can easily forget the real power and living connections humans can have - used to have? - with birds. 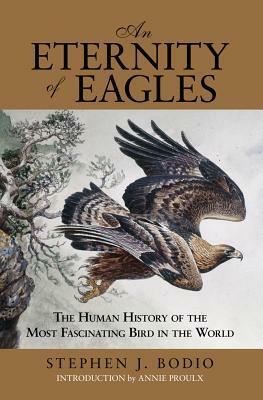 An Eternity of Eagles is not a field guide but a "human history" of eagles. The book begins with physiology - what we humans have learned about eagles through scientific study - but quickly moves to how humans and eagles have interacted in other fields: art, hunting, folklore. That feeling we get seeing an eagle float overhead is primal - rooted in mankind's earliest days of wild living. Bobio's book digs at that feeling, and traces our awe and respect of eagles from early cave drawings through to Native American totem poles, Greek mythology and to the modern symbol of America. I think birders will benefit from reading this book and remembering that our shared history goes far beyond JJ Audubon or RT Peterson. After all, despite all our scientific advances, those field guide pages will some day just be just be another set of confusing artifacts sifted through by future archaeologists trying to figure out what our civilization was all about. [Also, there's a crazy photo of a guy aiming a shotgun at a Golden Eagle from out the door of an airplane. We're terrible]. An Eternity of Eagles by Stephen J. Bodio is published by Lyons Press and is available here on Amazon.